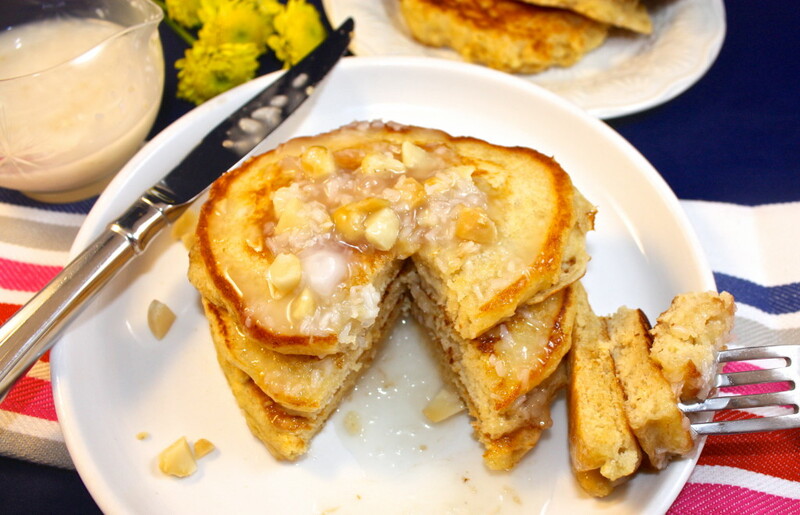 Fluffy pancakes with crunchy macadamia nut pieces topped with a flavorful coconut syrup! Are there certain foods and places that evoke memories for you? They do for me! Whenever I see a bottle of burgundy wine, I can practically smell my mom’s stew that she made every winter while growing up. Cheesecake takes me back to my first homemade dessert that I made from scratch as a newlywed. By the way, don’t ever describe a cheesecake as tasting eggy, because it may be a decade before it’s made again! haha-true! Prosecco whisks me to Italy where I had my first glass of the sparkling wine. 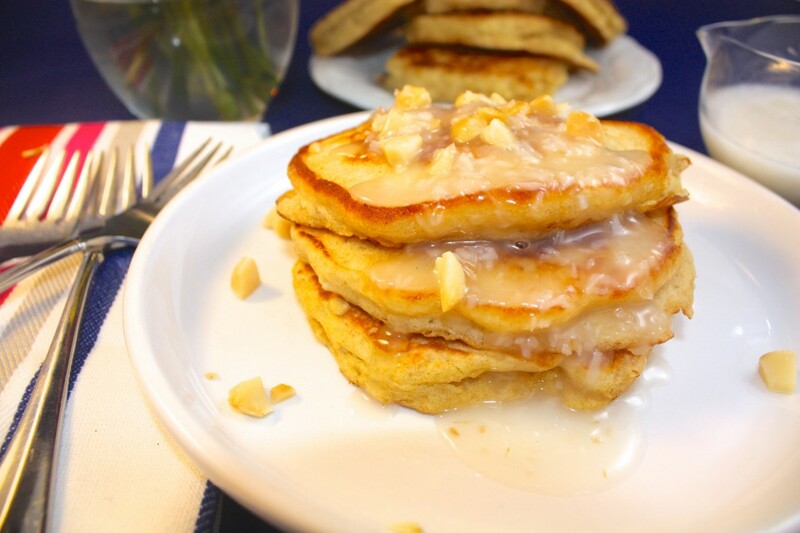 Macadamia Nut Pancakes with Coconut Syrup brings me to the tropical island of Hawaii! I’ve mentioned before that as a military family we were able to spend about eight years in Hawaii, and how special the island has been for us. I talked about our neighborhood happy hours and shared a watermelon margarita, and I also told you our son spent his Freshman year at the University of Hawaii, which btw was not a good fit for him, and he’s back at our local college. Pancakes. Back to delicious pancakes. Heather at Sugar Dish Me reminded me about the popular macadamia nut pancakes Hawaii has to offer when she shared a Toasted Coconut and Macadamia Nut Pancakerecipe. If you haven’t visited Heather’s website, grab a cup of coffee and visit for awhile. 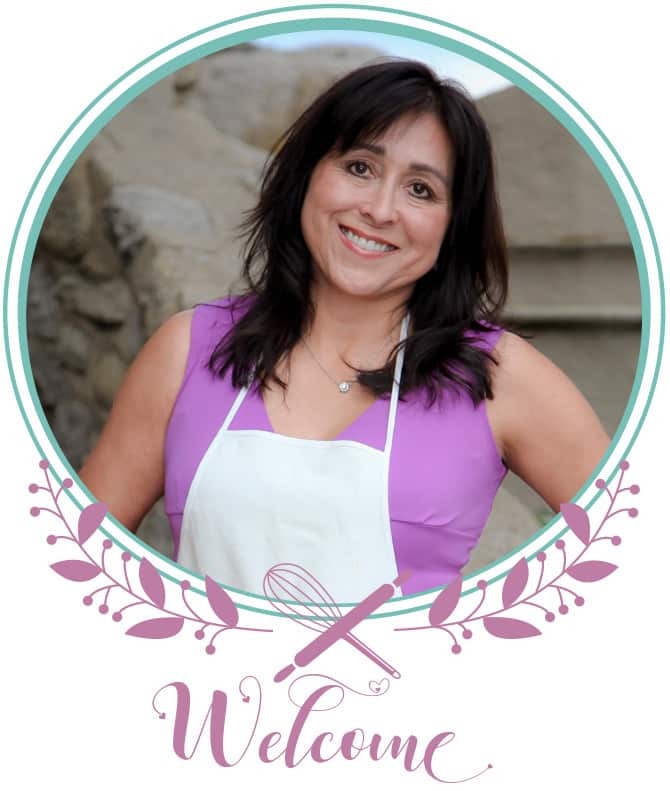 She has lots of yummy recipes I know you’ll love. I couldn’t stop thinking about how much I enjoyed going to breakfast in Hawaii and ordering either a Loco Moco or Macadamia Nut Pancakes with Coconut Syrup. The pancakes are so popular several companies like Hawaiian Sun sell pre-packaged mixes and syrups for the tourists to take home! Looking for a sugar-free alternative? Use xylitol instead of granulated sugar. It is the same consistency as regular sugar. 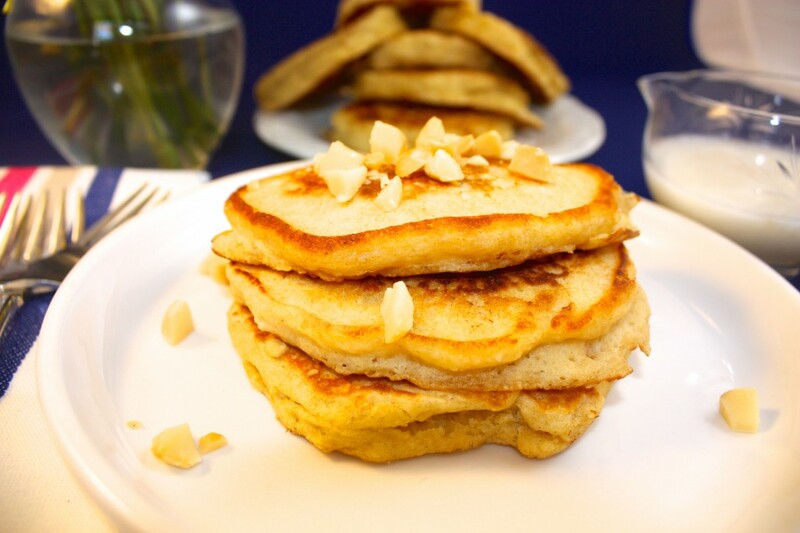 Fluffy pancakes with nutty macadamia pieces and a flavorful coconut syrup. In a small skillet toast nuts on medium heat until lightly browned. Remove and set aside to cool. Spray griddle or large skillet pan with non-stick cooking spray or grease with butter. Heat pans on medium. In a large bowl, whisk together flours, baking powder, baking soda, and salt. 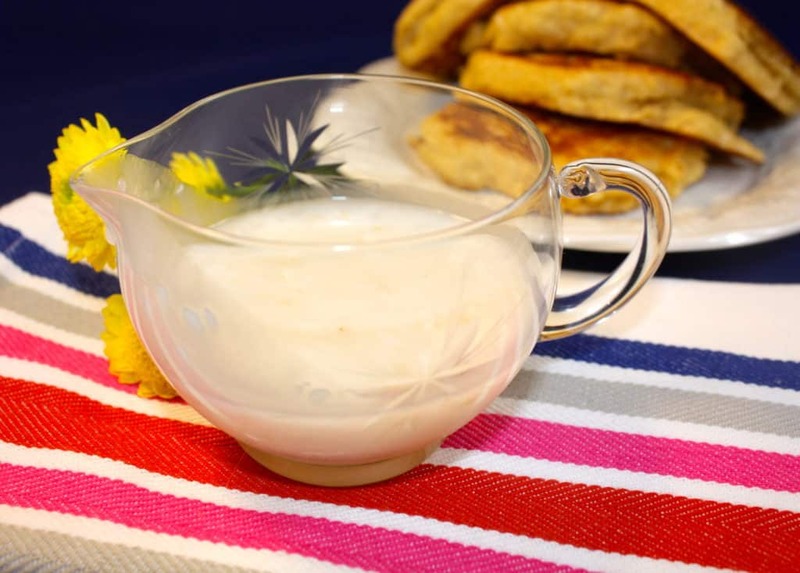 In a separate bowl whisk buttermilk, eggs, cooled coconut oil and vanilla extract together. Add the liquid to the flour mixture, stirring until moistened. Fold in macadamia nuts Don't beat or over mix. Drop about a 1/4 cup of batter onto prepared heated pan and cook until bubbles begin to form on the edge of the pancakes or until golden brown (about 2 minutes). Flip the pancakes and continue to cook for another 2 minutes. Keep warm in oven until ready to serve. Toast coconut flakes in a small skillet over medium heat until lightly browned. Remove from skillet and set aside to cool. In a medium saucepan on medium heat add coconut milk and sugar. Stir until sugar has melted completely. Turn heat to low and add arrowroot or cornstarch stirring until the syrup begins to thicken (3-5 minutes). Turn off heat and add extracts and coconut flakes. Serve over pancakes. Once the liquid mixes with the flour, the baking powder and soda is immediately activated, which is what helps give the pancakes their fluff. With the back of a spoon you may need to help the batter form into a circle by spreading the dough a bit. Keep unused syrup in the refrigerator and heat in the microwave or in a saucepan for reuse. For sugar-free coconut syrup, replace the granulated sugar with xylitol. Well, although I’m certain you would love to take a trip to Hawaii to try these delicious pancakes, don’t wait for the trip! You can whip up a batch of the syrup and pancakes right in your own kitchen! Turn on some Hawaiian music like Hawaiian 105 KINE , make these pancakes, and remember where you took your first bite of this onolicious (slang for delicious) meal. So pretty Sandra!!! Love the coconut syrup! Isn’t it funny how food can remind you of things? 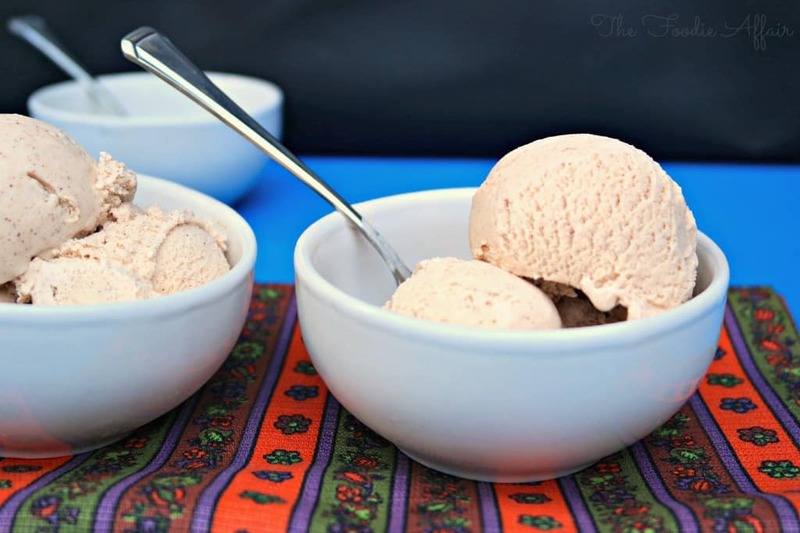 Thanks so much for the lovely mention and I’m glad I inspired a happy food memory! Love macadamia nuts so I know this pancake will be a favorite. I can see using your coconut syrup on French toast. I feel like I am in Hawaii… just reading your recipe. Great weekend breakfast like an escape to the tropics. Indeed 🙂 Thanks for stopping by!! 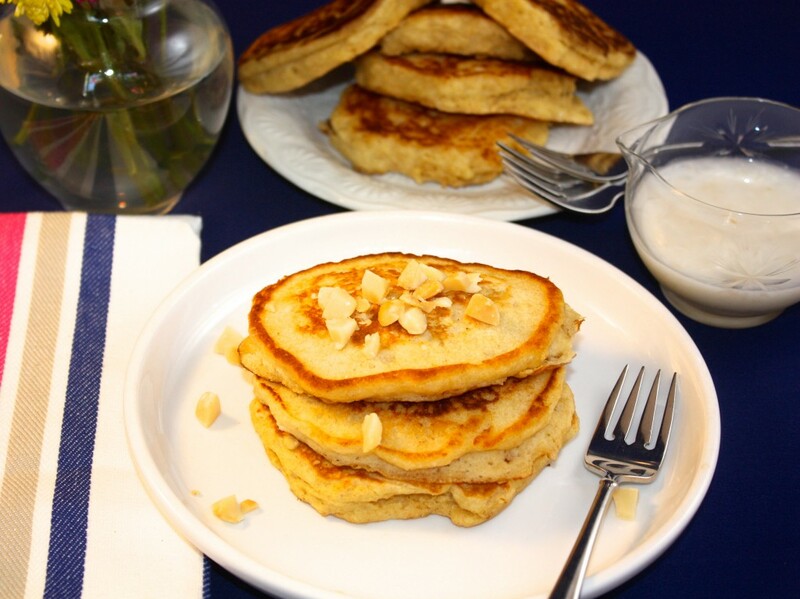 i guess this macadamian nuts pancake is just perfect to starting a day…. Hi Lynn! Yes, that is the perfect way to share. Thank you!! Macadamia nuts are native to Australia and I’ve never heard of macadamia pancakes? Yum.